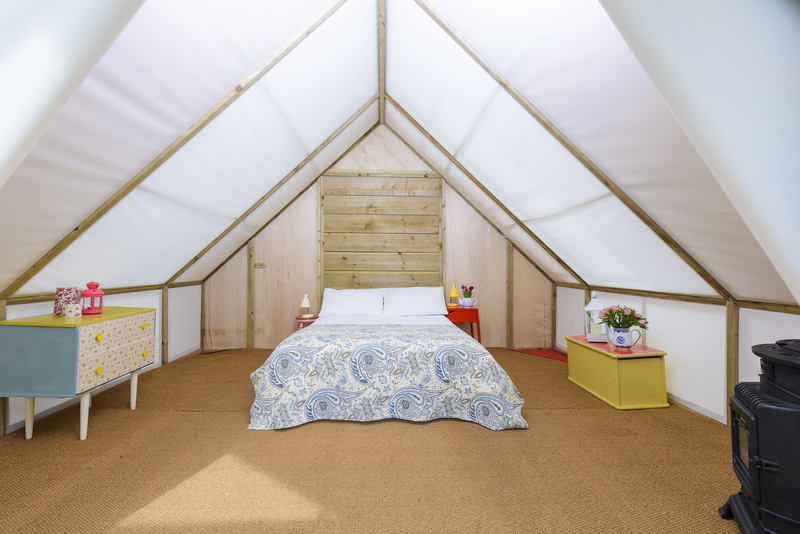 Killarney Glamping at the Grove offers a truly unique getaway exclusively for couples. The emphasis is on privacy and relaxation and with views of the Kerry Mountains and River Flesk at your doorstep you could easily forget Killarney Town Centre is less than 1 mile away. What also sets Killarney Glamping apart is that it is completely designed for all year round stays whatever the weather. The only difficult part is deciding between their award winning Romantic Glamping Suites or new for 2019 the Luxury Lodges. The Luxury Lodges promise to provide top class accommodation whilst keeping a sense of adventure to your experience. The totally bespoke design means you have your very own spacious bed room, bathroom and mini kitchen. Unwind in your spacious King Size Bed with luxurious 200 Thread Count linen and electric blanket. The kitchen has all you need plus little extras like a Nespresso machine. Enjoy a strong power shower in your bathroom. With heating throughout including on your private patio and a selection of board games to hand you may just find it hard to leave. With lots of upcycled storage this is a perfect base for both short and long stays. 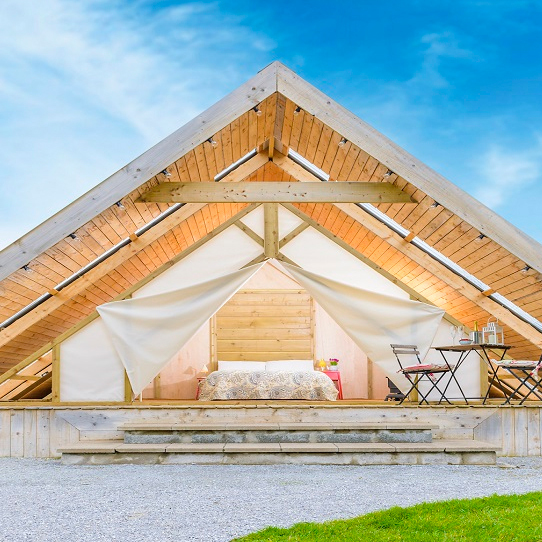 Experience a stay under canvas in a Romantic Glamping Suite with all-weather roof and private toilet. Each suite boasts a luxurious double bed complete with electric blanket, cosy stove and electricity. Enjoy a million stars from your private and heated patio or cook up a storm in your private sheltered kitchen alongside complete from BBQ to marshmallows. There great location is just a €7 taxi ride from Killarney Town or INEC (Irelands National Events Centre) and less than a mile from the National Park Gates. You will also be on the Ring of Kerry and Wild Atlantic Way driving routes. During these months we are open 7 days a week. As you approach Killarney Town you will reach a large roundabout (Lidl will be on your right). Take the 1st exit left at this roundabout signposted Cork. Continue straight ahead along this Bypass Road and pass straight through a smaller roundabout. You will then approach a larger roundabout and again proceed straight through sign posted Cork. Continue straight onwards passing a large SuperValu on your left (good stop for BBQ meats). You will drive down a small hill which has a right hand turn junction. Take this right hand exit signposted Woodlawn / Ballycasheen. We are about half a mile along on the left hand side. Look out for the peeks of our Bell Tents. AA Route Planner is a great tool. Simply type in your starting point and Killarney town as your finish and you will have a printable guide with detailed instructions from time it takes to things en route. As you approach Killarney you will drive through a small roundabout (national school on your left) and shortly after this is a sign for Ballycasheen / Woodlawn. Take this left turn and continue straight. We are about half a mile along on the left hand side. Look out for the peeks of our Bell Tents. How it Works: Use this gift voucher on AllGifts.ie to make a booking with Killarney Glamping. Or you can swap this voucher for any other gift or voucher listed on AllGifts.ie. Simply follow the instructions at the bottom of your voucher.